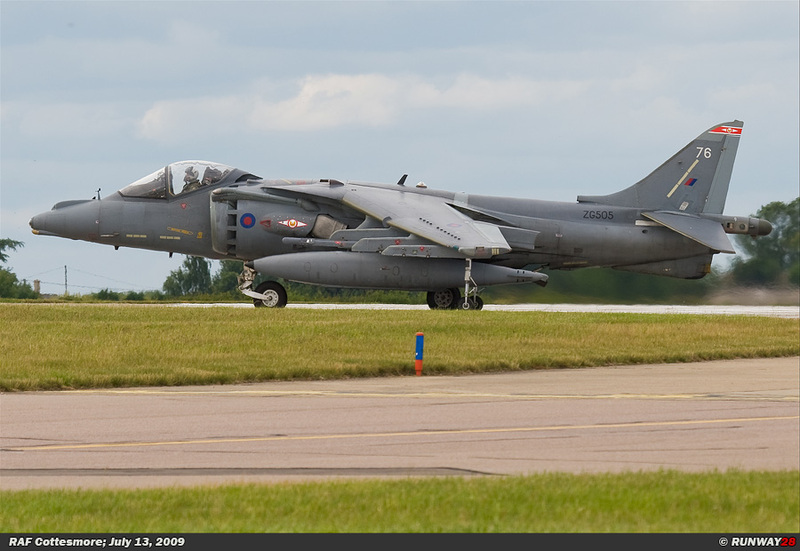 On Monday July 13th 2009, my journey through the United Kingdom started at RAF Cottesmore. 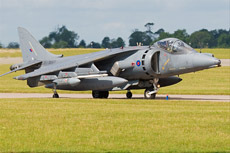 Most of the British Harriers are based at Cottesmore. The Harriers on this base are part of the Joint Force Harrier units (JFH) and are used both by the RAF and the Royal Navy. 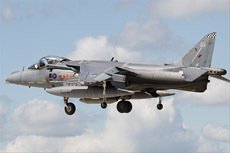 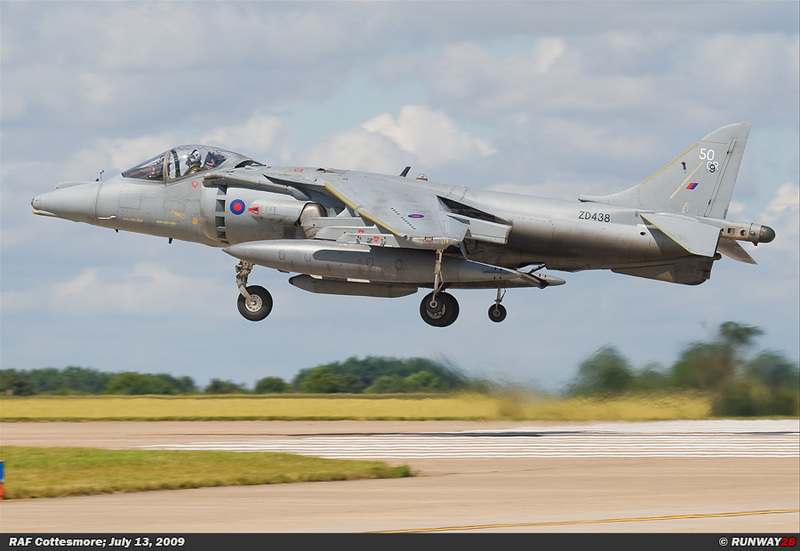 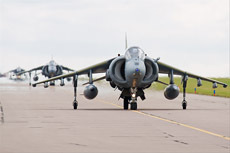 RAF Cottesmore is together with RAF Wittering home of the Harrier fleet of Great Britain. 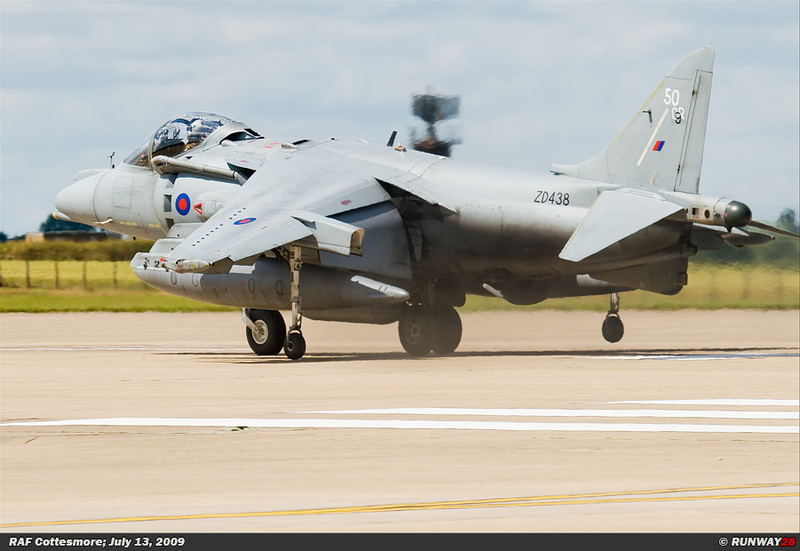 RAF Cottesmore is situated in the east of England and is located in the County of Rutland. 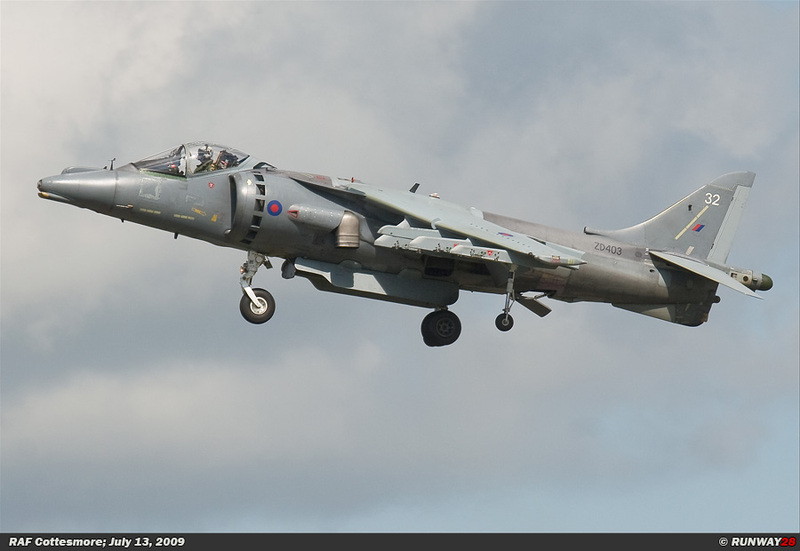 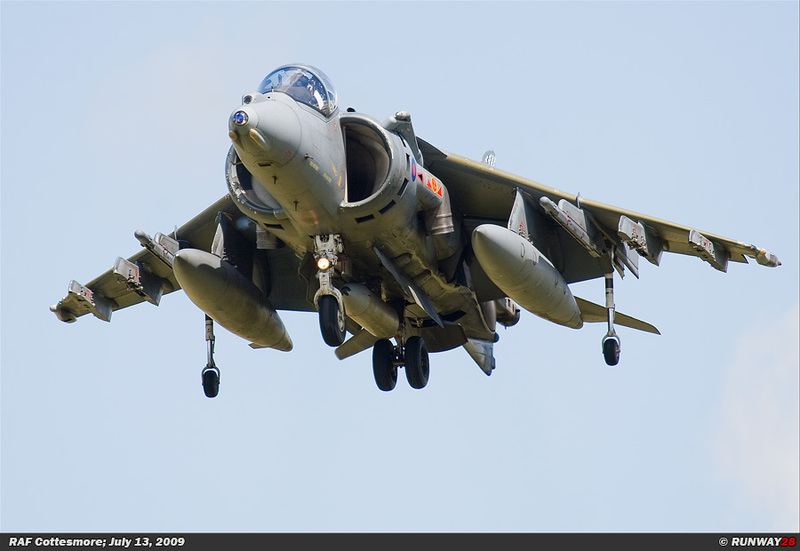 The Harrier is a fighter with full Vertical Short Take Off and Landing properties (VSTOL). In other words, it both can take off and land horizontally as a normal plane and vertically like a helicopter. 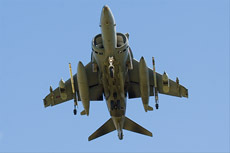 Next to this advantage, the disadvantage is that the aircraft has a relatively low speed because of its construction. It also can not break the sound barrier because of this. 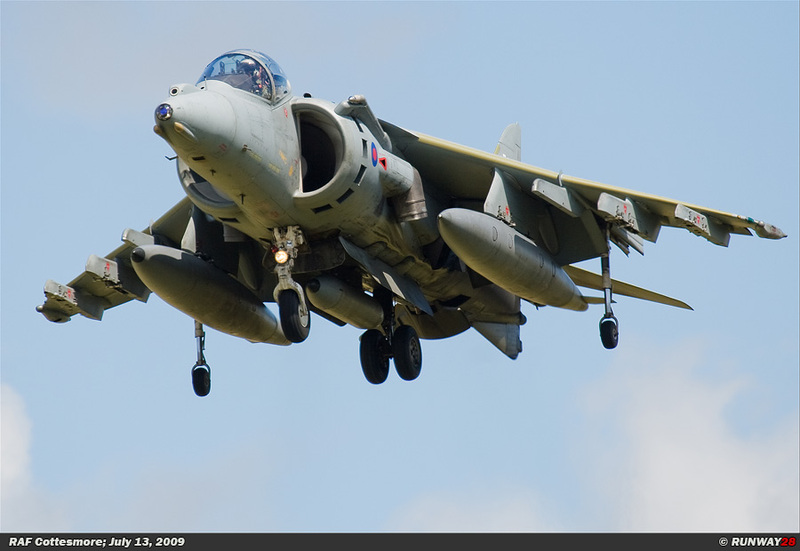 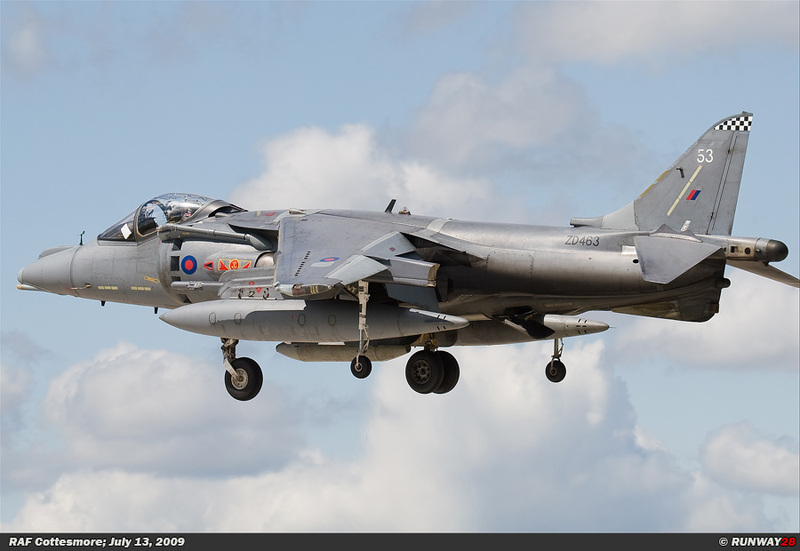 The Harrier was developed by Hawker Siddeley in the United Kingdom in the fifties and sixties. 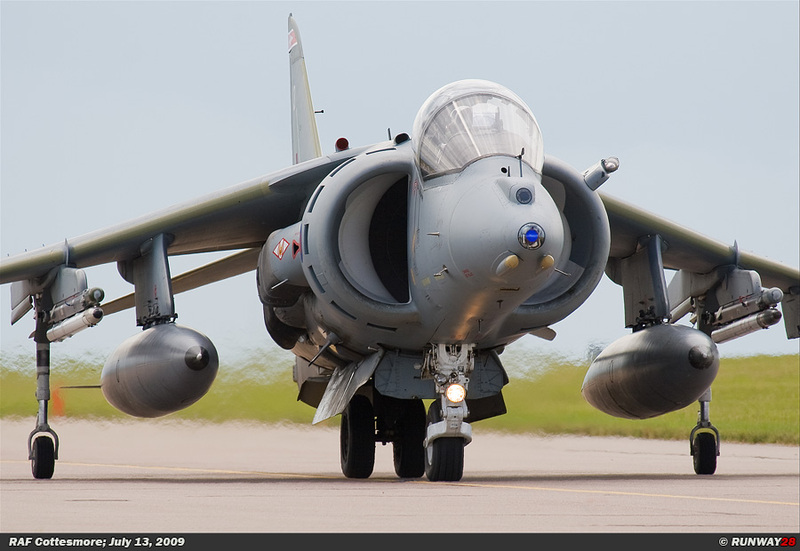 The first prototypes flew at the end of the fifties of the 20th century and were tested and developed during the next ten years. 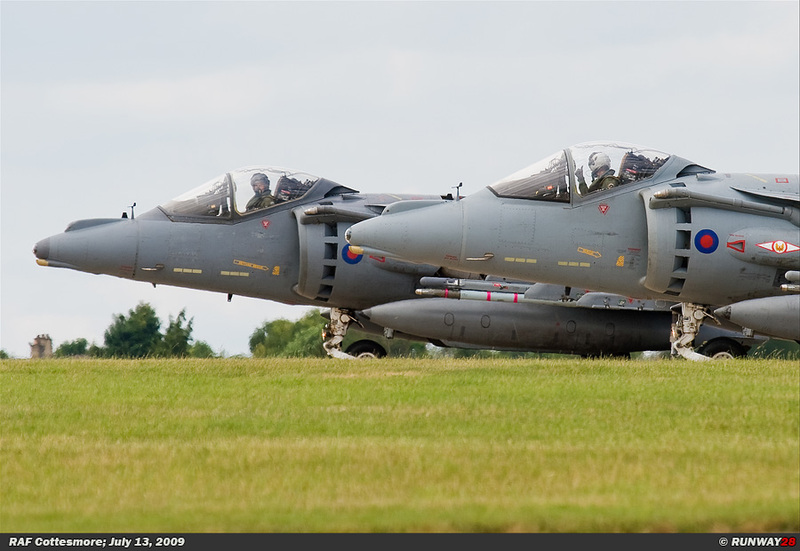 From the beginning of the seventies, the first aircraft were entering service in the RAF; these harriers were designated as the Harrier GR3. further because they retired at the beginning of 2006. 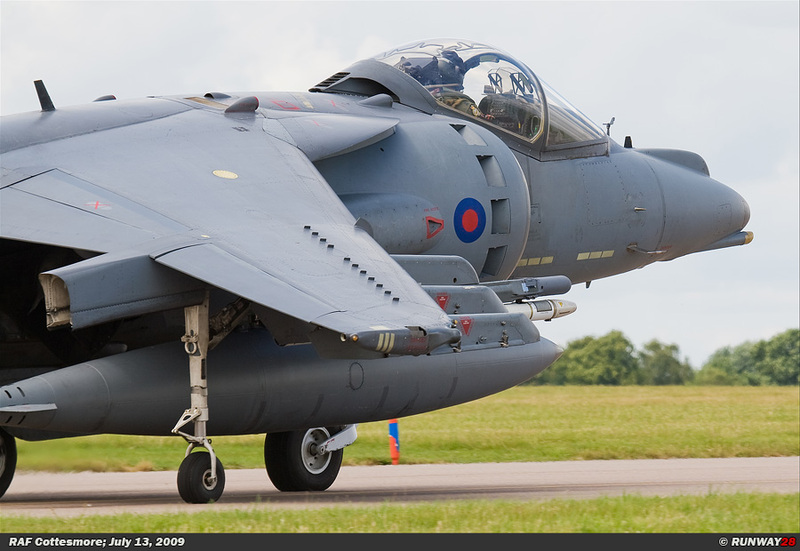 The British aircraft carriers are now equipped with the Harrier GR7 and the Harrier GR9 of the RAF until the Joint Strike Fighter will enter service in the future. 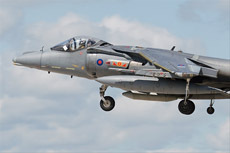 In 1982 the Sea-Harrier was used in a war for its first time during the Falklands War. 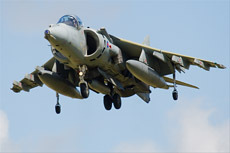 During the Falklands war, the Argentine Air Force and Navy had a numerical advantage of about 6 to 1 fighter aircraft. 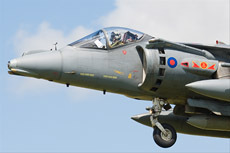 The old McDonnell Douglas A-4 Skyhawk of the Argentine Air Force wasn't really an opponent for the Harrier, but the Dassault Mirage III and Dassault Super Etendard were both capable opponents for Sea-Harrier. 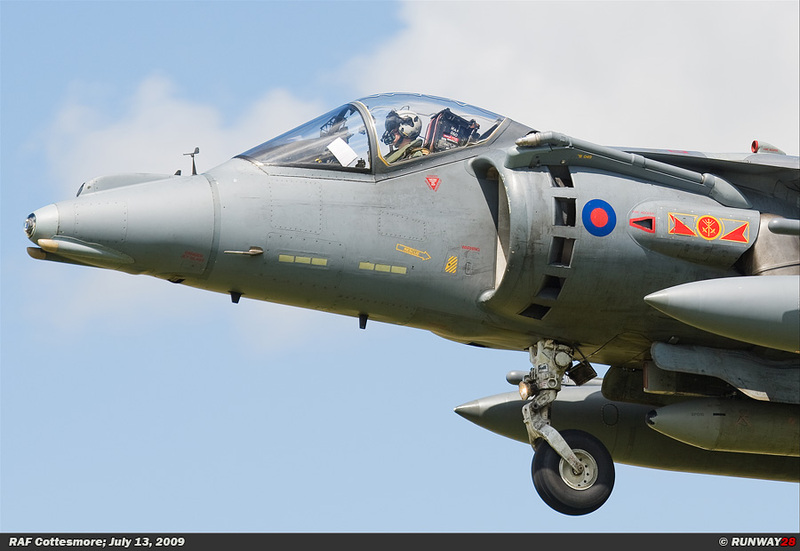 When flying over the hovering Harriers, the Argentine aircraft were shot down. 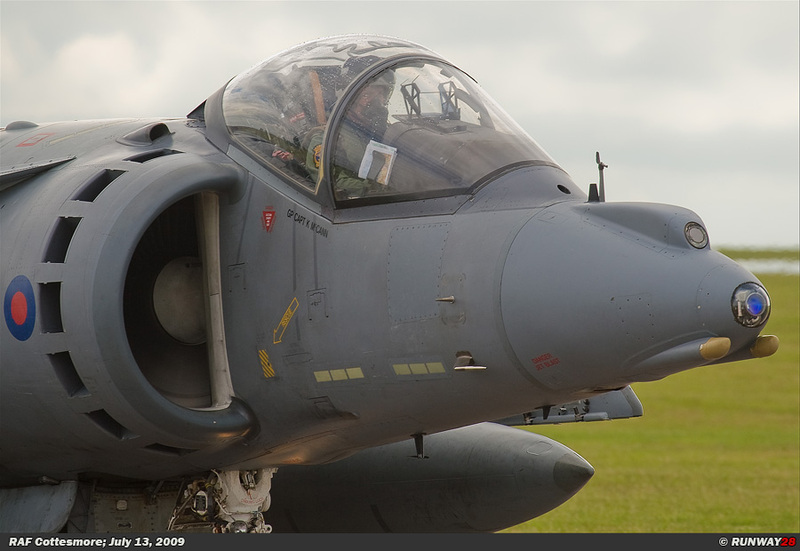 In this way the Argentines lost a lot of equipment. 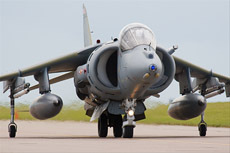 Despite to this success of the Harrier fleet, the Royal Navy lost some ships due to the Exocet raids by Argentine Super Etendard. 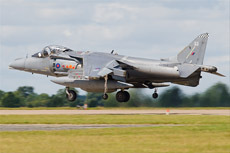 I arrived straight in from the Netherlands at about 11 am at RAF Cottesmore after a journey that has lasted throughout the night. I took position next to the fence near a crash gate where I could take some decent pictures of the taxiing harriers. After a while, two Harriers taxied right in front of us to the beginning of the main runway from where they should take-off. 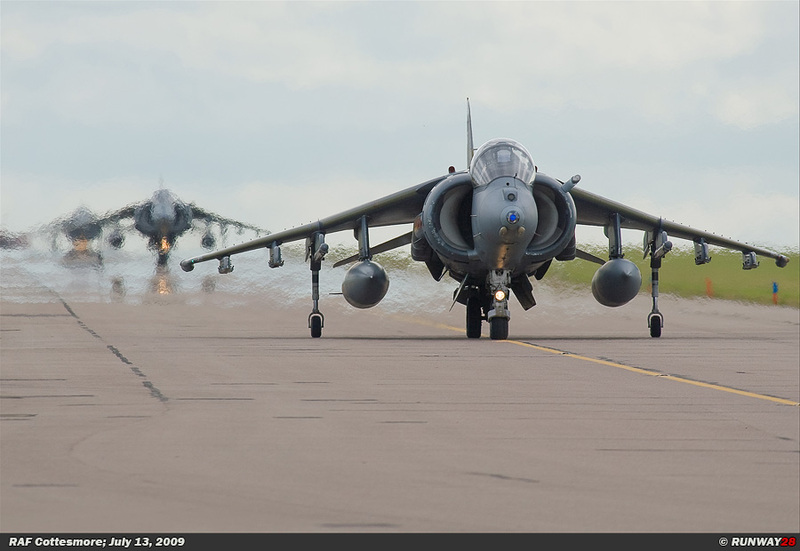 When these two aircraft rolled out in front of me, I discovered this wasn't the spot to be for today. 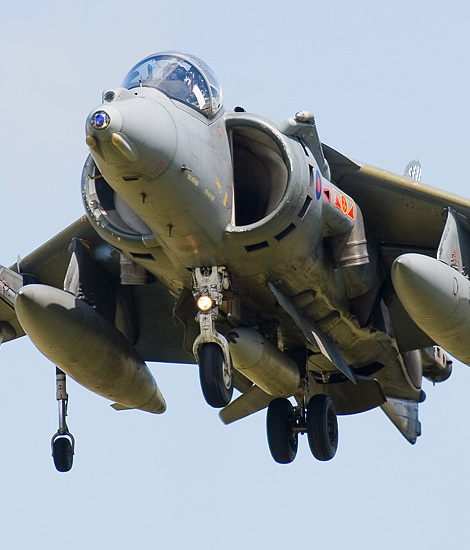 After a while I decided to walk to the landing area which was about 1.5 km away. This was a very wise choice, because over here I was able to stand almost on the taxi track and also it was very easy to take decent pictures of the incoming Harriers near the runway. 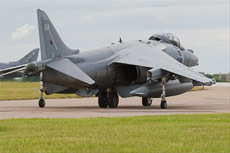 The Harriers came back after 30 minutes of waiting; only three Harriers flew this morning, sow it wasn't much. 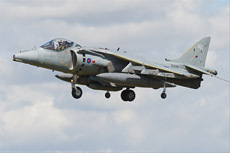 Harriers are coming in for landing at a very low altitude with a very low speed which is quite common at Cottesmore. 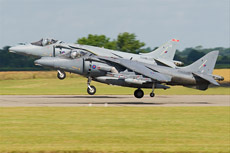 When they enter the main runway, all the aircraft are going into a hover above the threshold of the runway; it's very easy to shoot some decent photographs because of the short distance. 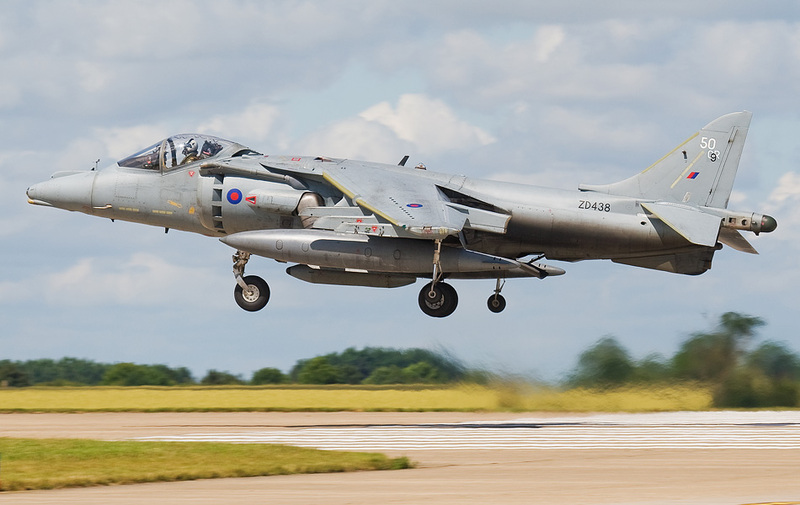 The spot at the landing area of Cottesmore is the most beautiful spot around this base because close range photography is possible over here. 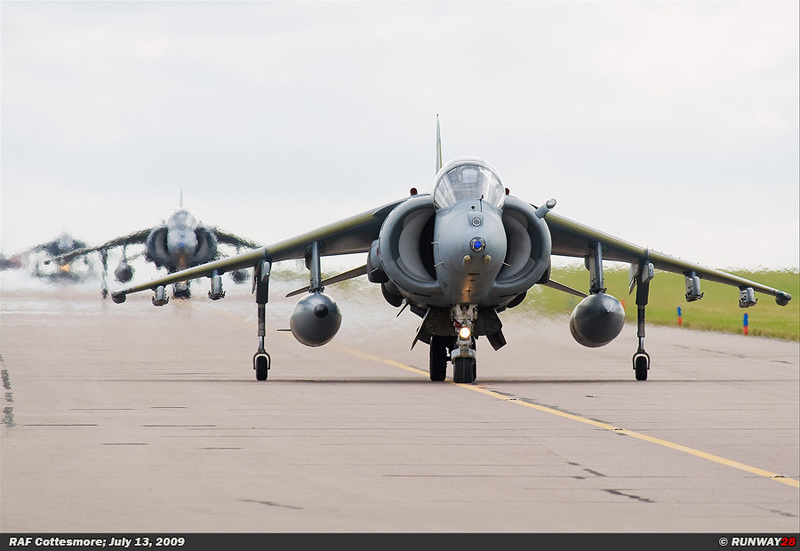 I was also able to take some beautiful shots on the taxi track of the harriers from multiple angles because I was standing in the corner of the taxi track where it bends to the runway. 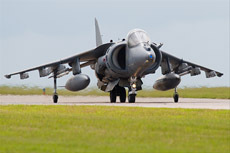 On the first sight it seems to be a quiet day, but this changed when no less than four Jump Jets came back from Yeovilton. 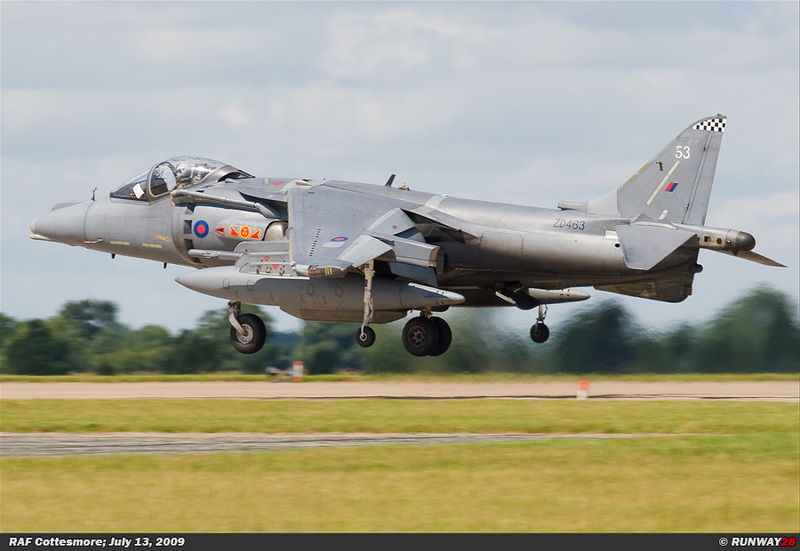 All four of them made several touch and go's before they came in for full stop; it was very easy to shoot some beautiful photographs of these harriers because of their slow landing speeds. When all these four harriers were on the ground, a two hour period of silence followed at Cottesmore. 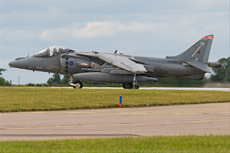 After waiting for a long period, finally some aircraft started up for the afternoon sortie. There were four Harriers which taxied in a row behind each other over the taxi track. 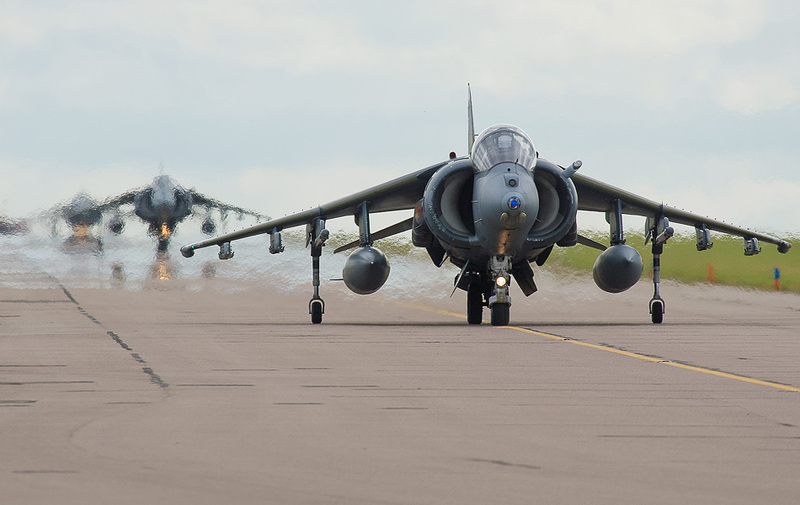 I was able to take some photos of all these harriers behind each other on the taxi track; it really was a beautiful sight. 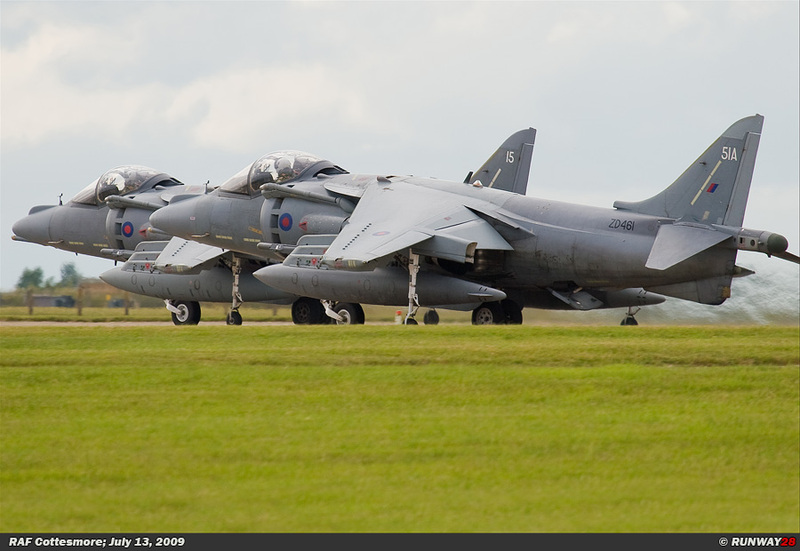 After a while this four ship returned to base and they came in again with a really slow landing speed. 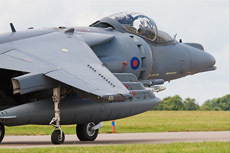 Meanwhile, also an Apache from Wattisham came in for a fuel stop at Cottesmore; this obviously was a very nice visitor. 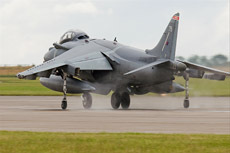 This base became very active in the late afternoon; again five harriers started their engines for another sortie. 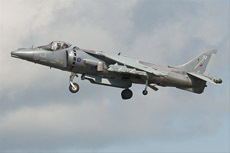 With all this action, a day which started quiet turned out to be an active day. 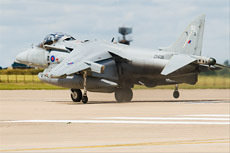 After a relatively short day I left this base at about 5 pm; I didn't sleep last night, sow I was very tired. RAF Cottesmore was a worthy start of my journey through the United Kingdom. 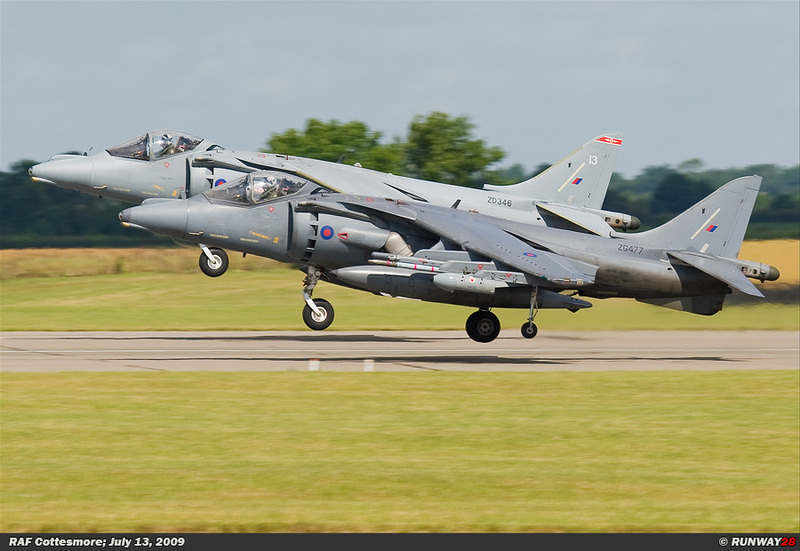 If this would be the trend of the trip, then its going to be a very pleasant week in the United kingdom. 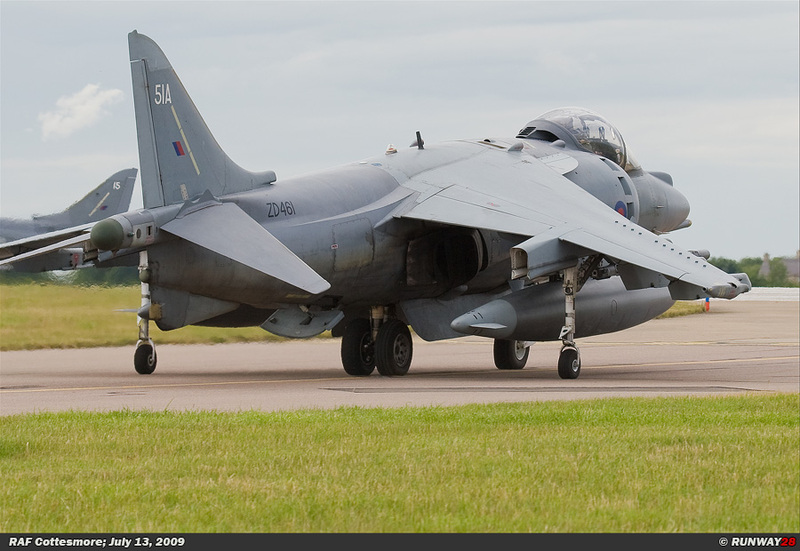 I was fulfilled and ready to go and I left RAF Cottesmore inbound RAF Coningsby where I was going to see the British Typhoons.